The Razorback Run 15K begins on the west side of the Northwest Arkansas Mall, on the outer loop, at 8:30 am. The course circles the Mall before exiting on Steele Blvd, proceeding across Joyce, and entering the Scull Creek trail. Runners will turn right and go through Johnson on the Clear Creek Trail, crossing under 71B, and making a loop around Veterans Park. 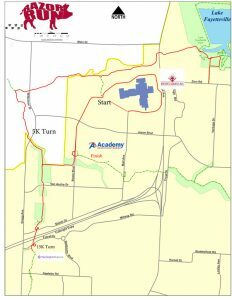 They will then return on the same trail crossing through the Fulbright Expressway tunnel, turning around behind Washington Regional Medical Center, and finishing on the South side of Academy Sports+ Outdoors, adjacent to the store. For details, please click the map for a large, downloadable version. For more detailed answers to questions please reference the FAQ page. Awards will be given for the Top 3 overall places and by gender, as well as for the top 3 finishers in each age category. A special prize will be given for the best dressed HOG or PIGLET. Click here to register for the Razorback Run 15K. Click here to become a sponsor for the Razorback Run.